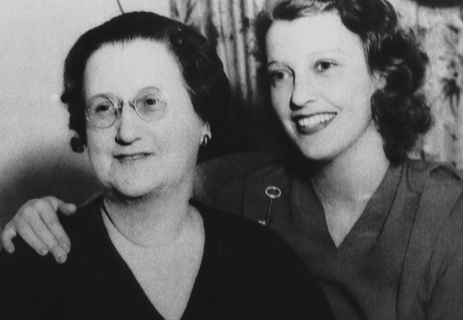 According to Jeanette MacDonald’s cousin, Katherine Rice Pickins, Anna MacDonald (Jeanette’s mother) was a “very good cook.” Katherine recalled visiting her aunt at the house on Arch St. in Philadelphia: “I remember going there for dinner and they had chicken pot pie…. Whatever you were going to have for dinner she put on a blackboard in the kitchen so you knew ahead of time what you were getting. She was the only person I ever knew who did that.” (excerpted from the book Sweethearts). Soak 3 tablespoons tapioca in warm water for two hours, then stir it into one quart of boiling milk. Let it boil fifteen minutes. Beat together the yolks of four eggs and one cup of sugar, stir them into the pudding and flavor with vanilla. Pour into a warm baking dish. Beat the whites of the eggs with three tablespoons sugar to a stiff froth. Spread this over the pudding and bake five minutes or until top is brown.